Adolph Bayers was born 1912 and died in 1978, he lived his entire life in Gilliland, Texas on the farm where he was born. He never earned his primarily living as a bit and spur maker and worked as a farmer for his primary income. After Pearl Harbor he joined the Navy and spent the was in the Pacific before returning home. Bayers did not have any teachers or famous makers who tutored him in the craft of bit and spur making and he developed a tremendous skill in metal working and silver engraving all on his own. He made bits and spurs as a hobby of sorts but he was very productive at it and his work was in high demand from those who knew about it. His bits and spurs were all hand made and he used very little machinery in his production. He was one of the earliest makers to use a consistent numbering and record keeping system, with sequential even serial numbers on his spurs and odd numbers on his bits. He also kept a notebook with sketches of each design as well as who bought the work, where they lived, and how much it cost. 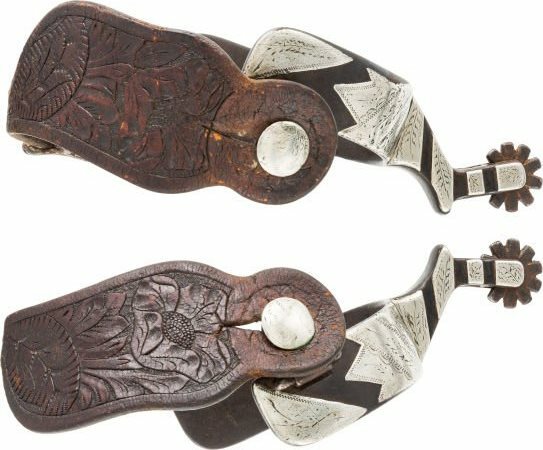 Adolph Bayers made bits and spurs from the 1930s to 70s and did primarily custom or special order pieces, frequently with the owners name or other personal marking such as a ranch brand in silver mounted onto the heelband, he did little or no silver inlay. His bits and spurs are stamped with “BAYERS” or “A. F. BAYERS”. Bayers’ bits and spurs were always in higher demand than he could produce and it’s said that at the time of his death to cancer, he still had over 50 orders waiting to be filled. As the collector’s market grows, Bayers’ bits and spurs are increasing in value and depending on the exact style, condition, and provenance they can be quite valuable. For help establishing the value of your Bayers’ bit or spurs, please Contact Us for more information. Click here for information on Adolph Bayers Maker’s Marks.